Manhattan is cured from the #SpiderIsland virus, thank goodness. Spidey gets to focus on his new role as a member of the Avengers in Avenging Spider-Man #1, a modern take on the Marvel Two-In-One stories of the Seventies! Brave? Sure. Bold? Uh-huh. Wise-cracking action? You can bet on it, Tiger! 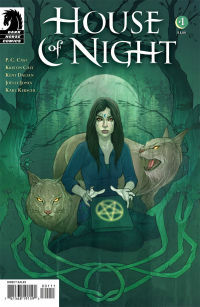 … House Of Night #1 follows chosen young ladies banished to the woods to survive a vampiric turn. Follow the fledgelings monthly from Dark Horse, in an adaptation and expansion on the NYT best-selling YA series! … What’s in your Magic Bag of Tricks? Something that’ll make you laugh, I bet! Catch a magic carpet ride to strange lands with Felix The Cat - Greatest Comic Book Tails softcover from IDW. Picks this week from LeaguePodcast.com. Newer PostClay in the Boston Herald - FASHION today! Older PostMC Frontalot Takes Rap ‘Nerdcore’ (11/9 @MidEastClub) from WBUR today!